When you hear the words ‘Harvard-educated', what comes to mind? Washington executive? Nobel Laureate? How about UC Cooperative Extension Farm Advisor. Katherine Pope, UCCE Orchard Systems Advisor, Sacramento-Solano-Yolo Counties. 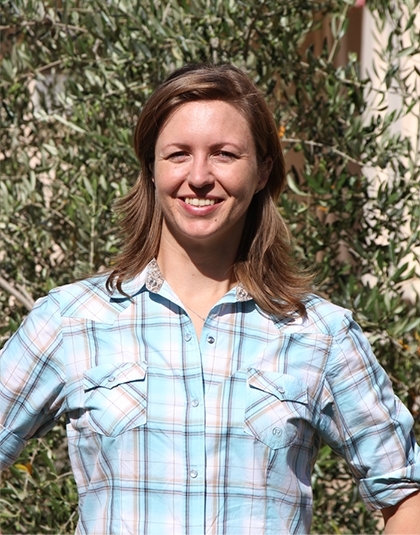 Katherine was hired last year to the position of Orchard Systems Advisor, working in a broad region which covers Yolo, Solano and Sacramento counties. She is delighted to stay in the area, as she had spent her youth in Sacramento, including a few years of houseboat living with her parents on the Sacramento River. Katherine's principal crop duties now include almonds, walnuts and prunes. She is involved in several projects, including rootstock and irrigation trials, and of course, is taking farm calls. Despite the demands of her new job, Katherine volunteered to chair the annual Pomology Extension Continuing Conference (PECC), which was held earlier this month. When asked about mentors among her colleagues in Cooperative Extension, Katherine begins to list a few: Ted DeJong, Rick Buchner, Franz Neiderholzer, Joe Connell, Allan Fulton, Janine Hasey…then summarizes: ‘I have the support of the whole network' of UCCE Farm Advisors and Specialists. So welcome Katherine Pope — intelligent, cordial, diligent—a great addition to UC Cooperative Extension.